Living a Fit and Full Life: Let Kids Know God has a Plan for them with the New NIV The Plans I Have for You Holy Bible by Amy Parker! 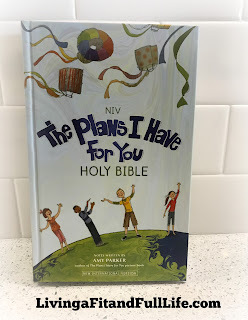 Let Kids Know God has a Plan for them with the New NIV The Plans I Have for You Holy Bible by Amy Parker! God has great plans for you. It’s true. The Plans I Have for You Holy Bible will inspire readers to dream about their future and to trust that God has great plans for each and every one of us. 50 God’s Big Plans pages tell how God had big plans for individuals in the Bible and his people as a whole, for example, Moses, Noah, Jonah, Esther, and YOU! 25 Promise Prayers pages focus on children asking God to help them fulfill his plans for them. 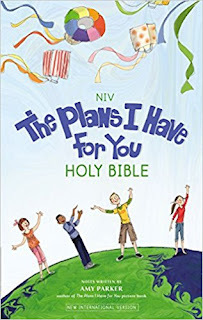 The NIV The Plans I Have for You Holy Bible by Amy Parker is a wonderful Bible for kids! The Plans I Have for You Holy Bible inspires kids to dream about their future and to trust that God has great plans for each and every one of us. This is a wonderful message and I love that it's strongly focused on throughout this Bible. My nine year old is always worried about what will happen when she grows up but since reading this Bible I've watched her become far less worrisome and love that she has begun to trust that God has a plan for her future. One thing I love about this Bible is the 25 Promise Prayers pages that focus on children asking God to help them fulfill his plans for them. For some kids praying may not be easy so I love to see guided prayers. The 100 highlighted verses are also terrific verses for memorizing and will surely help kids dive deeper into Gods Word! The NIV The Plans I Have for You Holy Bible by Amy Parker is an awesome Bible for kids and I highly recommend it! You can find NIV The Plans I Have for You Holy Bible by Amy Parker on Amazon, Barnes and Noble and other bookstores.